This was exposed to show the moons - ISO 3200, f/6.3, 1/200th. 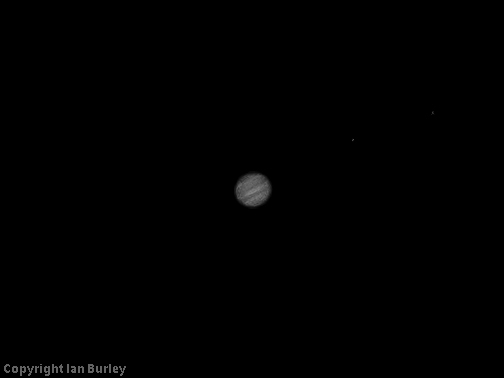 This was an attempt to show some detail on Jupiter but it's very faint - maybe a couple of bands. The moon to the right has disappeared because of the lower exposure: ISO 400, f/6.3, 1/200th. Both shots are reproduced at 2 image pixels to one displayed pixel. two really super photographs very well taken. Nice shot. 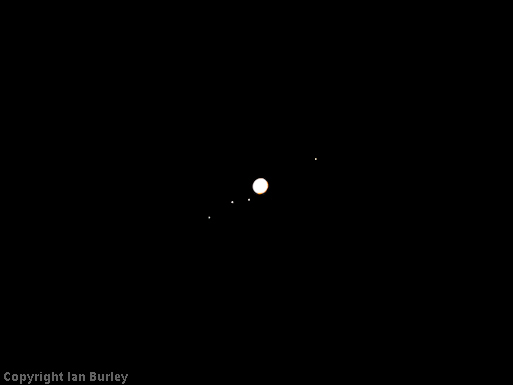 the Galilean moons are always nice to see. For anyone interested they are visible through any pair of binoculars. That's amazing, Ian. I really like the first shot, showing all the moons. I think you have done a marvellous job there. "Always shoot in RAW and avoid JPEGs"
When enlarged on my iPad Ian these look stunning. Great stuff. I might try again tonight with the 2x converter. This will make it equivalent to a 1200mm full frame lens. If (and it's a very big if!) there is any extra detail, I'll try stacking several shots. <snip>Both shots are reproduced at 2 image pixels to one displayed pixel. Don't you just love digital technology. As well as being good original images, there's the potential to enhance them in a somewhat similar way to that used by NASA, that a few years ago we could only dream of doing. I admire your commitment... I thought about it, but got to the back door and it was far to cold for me. Both are 1:1 (1 image pixel to 1 display pixel). Well done Ian, shows the bands pretty clearly. No colour though - did you desaturate? I thought the rings were orangey-brown. The first one you took tonight Ian is a cracker. I popped out with my 50-200 plus EC20 but mine arn't good at all. Saw three moons though. More impressive shots Ian, as Dave says that first one with the EC-20 is fantastic.